I knit all year long and like to carry my projects with me for appointments, when I travel , etc. I’ve tried several methods of keeping my yarns neat, tidy, and convenient all at the same time and found that an empty 5 quart plastic ice cream container works best. I usually work with more than one yarn at a time, so the ice cream container supplies plenty of room for my multiple balls or skeins. 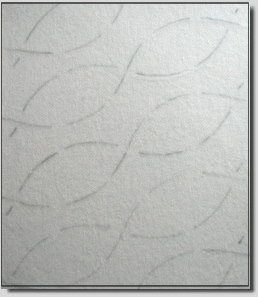 Using a regular hole punch, I created three holes at the outer edges of the top, separating them equally. 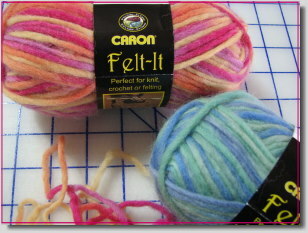 The yarns flow freely from each hole and never tangle. The container already has a carrying handle, so I’m good to go at all times. Of course, I had to embellish the container, so I pasted a pretty floral picture over the “Vanilla” imprint. Taking another stencil, I repeated the previous process, only this time I turned the stencil diagonally to add a little visual interest to this simple design. I wanted a different look for this piece, so I used the braiding technique that I posted in an earlier tutorial. 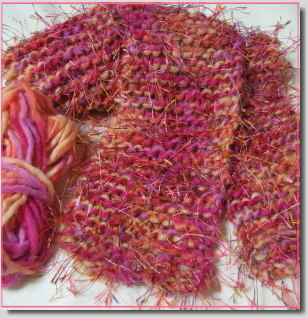 Using two skeins of Neon Felt It, I tacked down the beginning edges of the yarn and then crossed the yarns every three stitches. 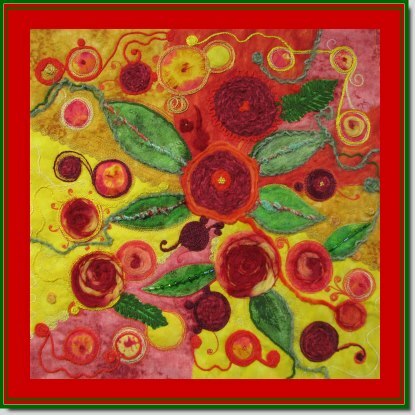 The colorful variegations combined with the curves of the design resulted in a piece that needed no added embellishment. That being said, I do think a little stippling or meandering inside the curves with a specialty thread might also be nice. If it were the surface of a quilt, I might add a different fabric inside each space delineated by the curves (and I would use a different fiber for the braiding, possibly silk). With yarn to spare, I moved on to a completely different project. 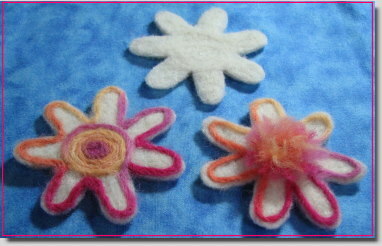 I had some needle felted flowers that I had made previously using the technique from Natural Blooms. I set up the Babylock Embellisher with three needles. 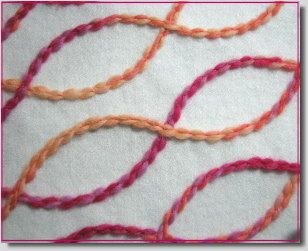 Next, starting in the center of the flower, I tacked down the edge of the yarn. 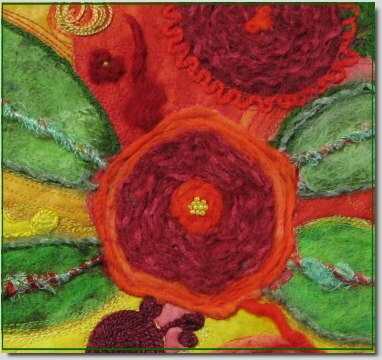 Then I slowly moved in a spiral pattern, lightly felting the yarn to the flower. 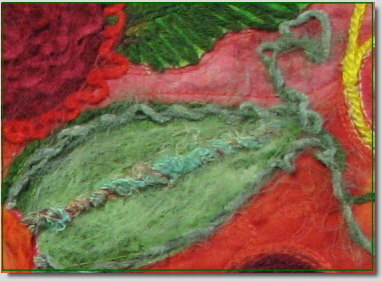 For the petals, I simply looped the yarn and continued felting. 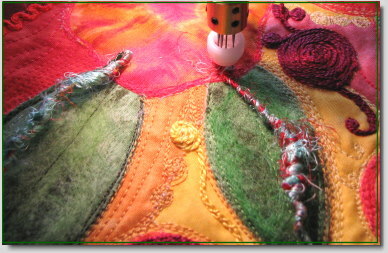 When the flower was complete, I tucked the tail of the yarn under some previous felting and did a quick tack down. Don’t these look like decorated sugar cookies? 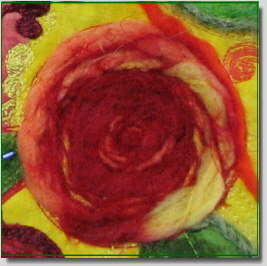 In the second flower, I skipped the spiral center, felted the petals, and then tacked down cut pieces of yarn. A little fluffing and my flower was finished. This yarn was just too pretty to put away, so out came the needles and you know the rest of the story. 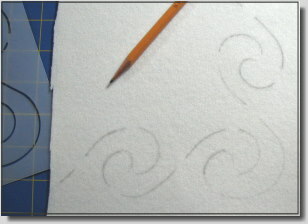 With four felted circles completed, I was now ready to begin embroidering the flower outline that I had previously digitized for this project. 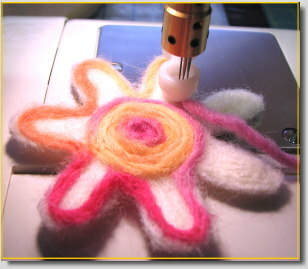 The flowers measured 90mm and the stabilizer was already part of the felting process, so all I had to do was hoop each circle and push the start button. 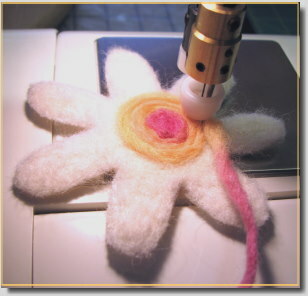 After the outlines completed stitching, I took by little pair of Fiskars clippers and began carefully cutting out each flower just inside the stitching line. This is easy to do and results in tidy shapes every time. Also, all those little pieces that fall away as I cut can be gathered up for another project, such as a little felted flower embellishment. 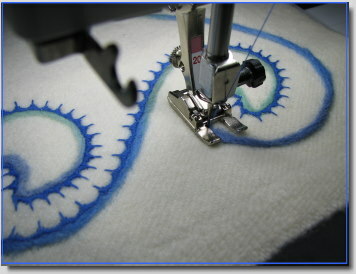 This process could also be accomplished with a template and a fabric marking pen, so an embroidery machine isn’t an essential part of the method. Once the flowers were completely cut out, I flipped them to their reverse sides, which now became their front sides. 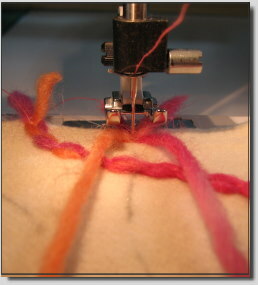 Felting produces a two-sided fabric; one side will be more textured than the other. Usually the reverse side has a smoother appearance, and this was the look I desired for my flowers. 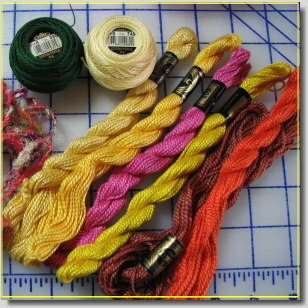 Next, I picked out a medium weight chenille yarn that was wrapped in rayon thread. 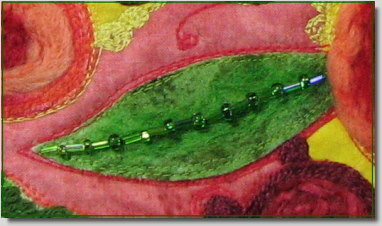 Rather than couching or machine felting the yarn, which would have changed its appearance, I chose to attach it to the edges of my flowers with a light touch of permanent fabric glue (easily accomplished with a thin bamboo stick). 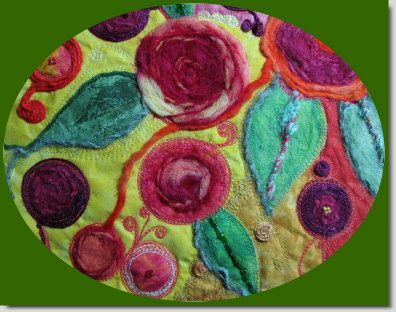 For the base fabric, I chose natural 100% wool yardage that had been previously felted in the washing machine. 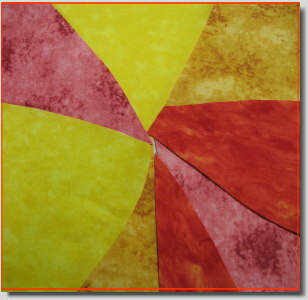 This piece will eventually become a handbag, so I backed it with Decor Bond, a heavy fusible stabilizer. I could have sketched a winding pattern to follow on the base fabric, but instead I just took my time and formed winding curves as I stitched. 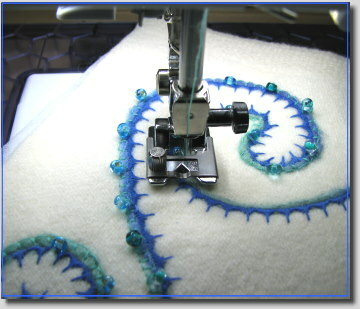 The beginning and ending stitches were deliberately placed so that a flower would cover them. 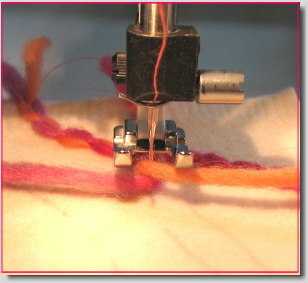 After completing the couching, I gently brushed the yarn towards the stitching so that the one-sided straight stitches were covered. 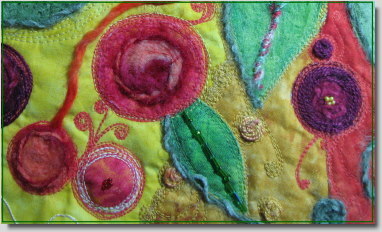 I placed the first two flowers over the beginning and ending stitches, measured their edges from the side of the fabric to make sure there was plenty of seam room (about a 2 inch allowance), and then placed the remaining two flowers here and there until I found positions that visually pleased me. 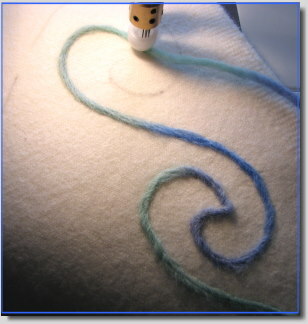 Again, I didn’t want to change their appearance in any way by machine felting them, so I attached them with fabric glue. In part three, my natural blooms will receive some additional embellishments. My quilting group went on a field trip to Black Mountain last year. The destination was a local quilt shop, but we noticed a yarn store around the corner. If you’re a knitter, you know the feeling of walking into a new world of wonderful yarns and fibers that all require close examination and the touch test. Of course, this can take hours and hours. 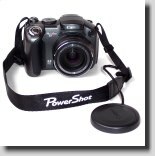 This particular store and numerous isles as well as walls full of their precious product. Well, when my group had completed their tour, I had only reached isle two! 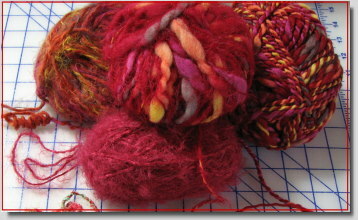 All this to say, I love yarns and fibers and the synergy they produce when combined. Maybe it’s the surprise effect that unfolds as I knit those first few rows. 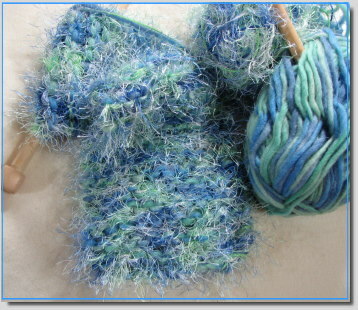 Over the weekend, I combined a thick blue chenille with a variegated eyelash. The eyelash contained three colors: red, blue, and golden yellow. When I measured the length of the individual colors, I was surprised to find that they were approximately 160 inches long. That accounts for the nice wide bands of color in this scarf. 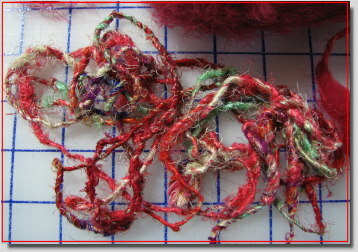 I may knit another scarf using red chenille with the same eyelash and see what happens.